3D printing is going to change manufacturing, change the products we create and consume, change the world. A few years ago, 3D printing (a colloquial way of referring to additive manufacturing) was suddenly everywhere, and the hype surrounding it was big. Really big. In all the excitement visions of completely ‘printed’ cars, printed organs, and Star Trek like replicators in the home abounded. As the fog of hype lifted it became clear that there would be changes, but not like those that were prophesied, well for now at least. Now, businesses are focused on seizing the opportunities with truly promising futures. One such promising opportunity that has emerged after the hype is customization. 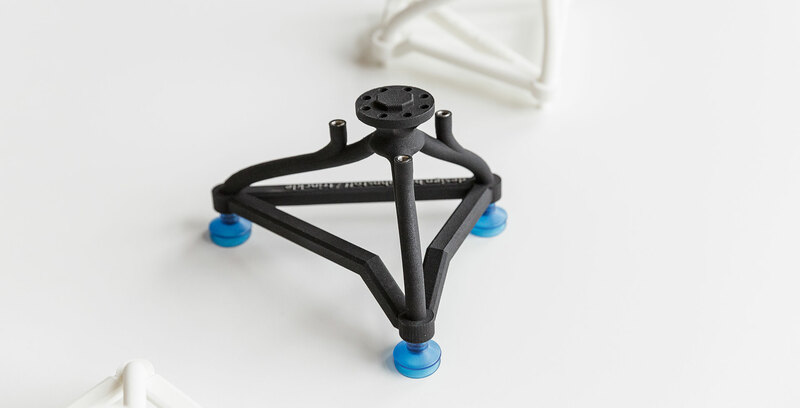 Across countless industries the possibilities of additive manufacturing for creating custom products has become clear, indeed customization has been touted as 3D printing’s killer application. Of all the benefits that 3D printing generates, (viable, cost-efficient) customization is far and away the most important. No other ‘application’ of 3D printing has the positive potential of customization. Whether that means: creating products perfectly tailored to specific applications or users, triggering changes that improve supply chain efficiency, or laying the groundwork for entirely new business models, customization is at the heart of all of these opportunities. So, let’s take a closer look at what makes customization so meaningful for businesses and consumers alike. It was only a matter of time before businesses began to realize the potential of 3D printing for customization, and this trend is really starting to pick up. 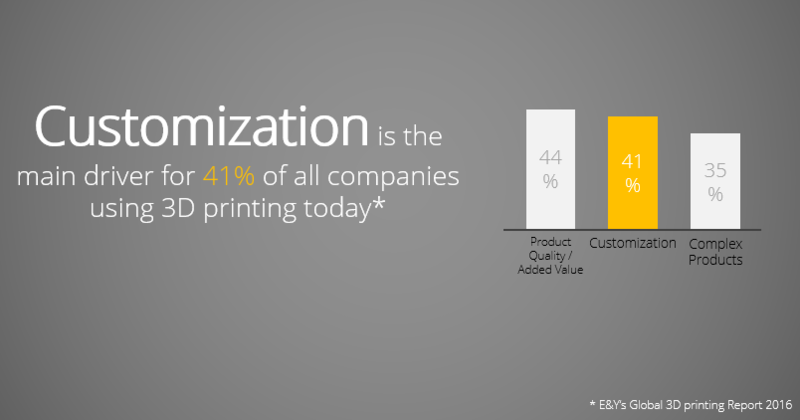 A recent study conducted by Ernst & Young found that 41% of companies see customization as the most important driver of 3D printing (E&Y, 2016), and this is not surprising. Additive manufacturing technologies are by their very nature perfectly suited to creating custom products. This can clearly be seen when it comes to the manufacturing process itself. Additive techniques do not require tools or molds made specifically for a product, meaning there is a great deal of flexibility to customize. As long as the digital model is sound, the product will turn out. Furthermore, unlike an assembly line, a 3D printer can just as easily produce 1000 identical items as it could 1000 individual ones. Now that the technology has finally reached the point where large-scale production is possible, “Buyers can choose from endless combinations of shapes, sizes, and colors, and this customization adds little to a manufacturer’s cost” (Harvard Business Review). The added value of customization for businesses is clear: customization will allow them to expand their product portfolios and serve any niche group, without obliterating the bottom line. But, it is not just good news for businesses, customers will also win. Ergonomic customization: This kind of customization is important for products that need to be adapted to the human body. Not only does a perfect ergonomic fit improve user comfort, but also in many cases the usability of a product. Ergonomic customization has found application in industries like medtech, footwear, and eyewear. Functional customization: There are countless cases where a component needs to be tailored to its particular application. Functional (or mechanical) customization improves efficiency, safety, and speed of mechanical processes. Take for example the case of robotic grippers used in the manufacturing process. These components often have to be tailored to the objects they will be handling and moving around a factory. If the fit between gripper and object is not perfect it can lead to delays or damage. Aesthetic customization: And finally, there is aesthetic customization. Perhaps the most familiar form of customization, it refers to the tailoring of the visual elements of a product to the taste of the customer. Thanks to additive technology, aesthetic customization can move beyond merely picking a color to altering: texture, shapes, size of design details, and so much more. One industry where aesthetic customization has found enormous traction is jewelry. Mass produced jewelry lacks the individuality and personal-quality that most of us want in these accessories. With AM, each piece can be tailored to reflect the wearer’s personality. Beyond getting products that perfectly address their needs, customers enjoy other benefits. With customization, come new opportunities to involve the customer directly in the design process. They are able to engage with a product in a totally new way. And, before you write co-creation off as just another marketing stunt, co-creation has been linked to a higher willingness to pay, increased customer loyalty, and a higher net promoter score among customers. The benefits of customization are clear, but it is not as simple as buying a printer and pressing go. As the demand for custom products grows, businesses will face challenges, challenges that cannot be solved with AM hardware alone. Ultimately, software will need to come into play in order to unleash the full potential of customization and additive manufacturing. By now it is not hard to see why customization is 3D printing’s killer app. Custom brings so many new opportunities and benefits with it, but it is not without its challenges. And, the make or break factor is design. Custom products require custom designs and, in the case of AM, custom 3D models. When all of this customizing is done manually, the efficiencies gained through AM are lost, and customization becomes an expensive exception, instead of the rule. In order to make customization business models feasible, businesses will need to find a way to automate the design process for custom products. Below we’ll explore this through our recent partnership with Kuhn-Stoff. In the (mass)customization economy, there is a divide between the creation of customizable 3D models and those demanding custom goods. Whether your average user interested in ordering a custom toy online or a skilled optician tailoring a pair of glasses to a patient, neither is likely to learn a new skill just to get an individualized product. So, the manual design effort associated with the custom good remains with the business or manufacturer. But changing each design ‘by hand’ takes far too long, drives up cost, and makes these customization business models infeasible. Without tools that can automate the design process for additively manufactured products, innovative ideas quickly hit a wall. To make the magic happen, exciting new ideas are going to need a little help from software. Our recent collaboration with, Kuhn-Stoff GmbH & Co. KG, demonstrates perfectly the ability of software to make customization business models possible. In this project, we focused on automating the customization process for the manufacture of custom robotics components. The gripper systems Kuhn-Stoff manufactures have long since been optimized through the use of additive methods, improving lightweight construction, reducing the number of individual components, and cutting production times. But, many customers also requested custom grippers, and therein lay a fundamental challenge: how to efficiently create the models for these custom components? For the design of a single custom gripper Kuhn-Stoff’s engineers required up to 8 hours. Both the design time and costs meant that this custom robotic gripper business could not be scaled. We worked with Kuhn-Stoff to create an application that automated the design of these custom grippers, cutting design times from over 8 hours to a matter of seconds. Moreover, the powerful algorithms behind our software do all the heavy lifting, meaning anyone can create their custom gripper, no CAD expertise required. With this gripper configurator in hand, Kuhn-Stoff can both automate internal design processes and integrate customers in the design process. 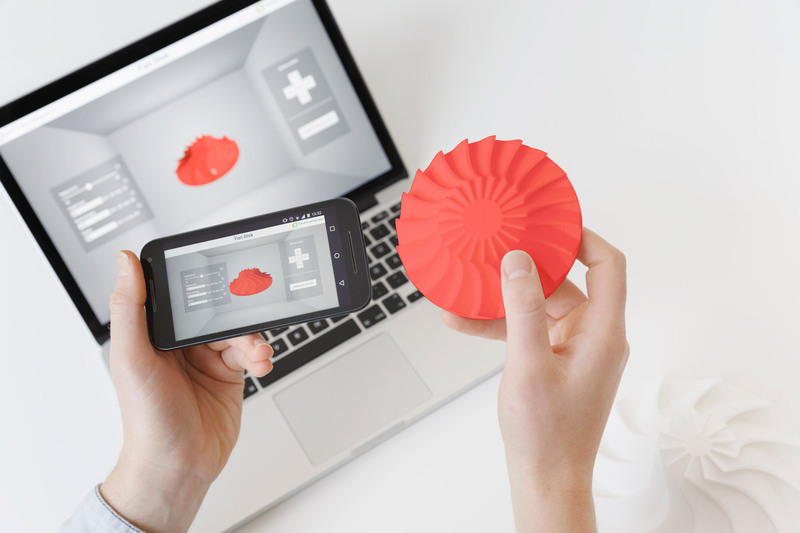 It turns out that the killer application of 3D printing needs a little help from software. When AM hardware is combined with software, products and business models that once looked like gimmicks or PR stunts become full-blown businesses in their own right. In the age of digital manufacturing, software is the missing link between product design and customization. As the production capability of AM technology improves, more and more businesses will look to see how this technology can be used within their production process. The consensus is fairly clear: the technology will improve and serial production will come into reach. This is all great news especially for businesses looking to offer custom products. However, as we’ve made fairly clear there is still a major piece of the puzzle missing. In order to realize the full potential of customization and break away from mass production, businesses will need to combine additive manufacturing with a new breed of software. Like the example of Kuhn-Stoff demonstrates, our customization platform, paramate, is designed to close this gap and enable businesses to revolutionize their products. paramate’s powerful algorithms combine base product models with parametric design principles to automate the configuration of any customizable product. From jewelry, to robotic grippers, to custom insoles, paramate supports customization business models in any industry. Beyond dramatically improving the efficiency of product design, it allows end customers to be involved in the process. With paramate, you can also create intuitive, web-based configurators that can easily be integrated in an e-Commerce system, which means co-creation of custom products just got easy. The next age of manufacturing is here, and it will be defined by AM and customization. At trinckle our mission is to make its benefits accessible to anyone, and to help businesses and their customers create truly awesome custom products.